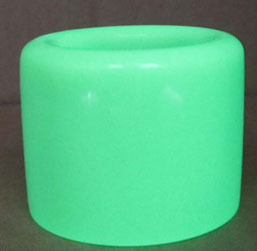 The rare earth-activated alkali earth aluminate-Strontium(Sr) photoluminescent pigment, with the chemical formula of MO·aAl2O3·bSiO2·cL: Eu2+Dy3+, compounded by high-temperature solid phase reaction, is a novel, durable, effective, and environmentally friendly material. Luminescent Mechanism: When exposed to certain wavelength of light, material was activated after the ground-state electron in the molecule absorbs energy, a transition is made to high energy track. However, as high-energy orbit is not stable, electronic spontaneously transit back to the original track while emitting energy in the form of light. When there is light again, it stores energy again. So the photoluminescence process is circulatory. 2. Long afterglow time: absorb light during the day, glow over 10 hours in the dark, its luminous intensity and the maintenance time is 30 times more than traditional luminescent material. 4. Weathering good: material stability and weathering resistance, excellent in outdoo r use with no limitation with unlimited glow cycles. Suitable for various kinds of transparent medium, such as paint, screen printing, plastic, glass, coating, powder coating, ink, enamel, ceramic and fiber. Can be applied in switch of home appliance, control board, plug, lock, electric torch, stairway, fire protection facility, fire alarm, lifesaving tools etc. Show safety indication effect in fields as below: Signs, warning items writing, emergency passenger path, subway station, underground passage, blindage project, hospital, dancing hall, video room, refuge shelter, helmet, bicycle etc. Building: Can be practically and artistically applied to building wall, tiles, inside elevator, bridge, roads, sea ports etc. Arts and crafts, amber, sand crystal, glass, painting works; toys: Plastic toys and piece together pictures; clothing: Shoes, caps, working uniform, helmet, transfer pictures, printing graph clothing; calendar, fishing tools. 25kg /barrel (Volume: 33cm x 37.5cm), lined with two plastic bags, and one dry placed in.